Get great digital shots with your Canon EOS 7D Mark II This full-color guide to the features and functions of the Canon EOS 7D Mark II makes it easy for first-time users to get the most out of the camera and capture cool, professional-level photos. Get great digital shots with your Canon EOS 7D Mark II This full-color guide to the features and functions of the Canon EOS 7D Mark II makes it easy for first-time users to get the most out of the camera and capture cool, professional-level photos. 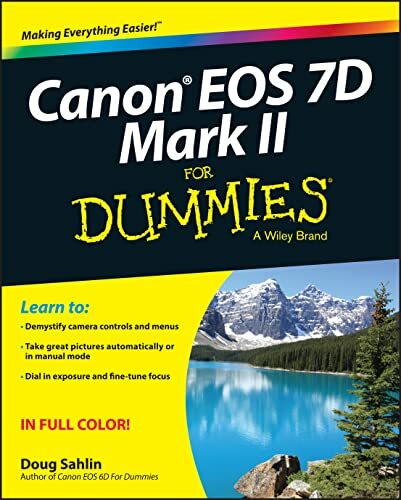 Packed with examples on how to create eye-popping digital photos, Canon EOS 7D Mark II For Dummies gives you a plain-English tour of the camera's controls, shows how to manipulate focus and color, gives step-by-step instructions on how to shoot better low-light and action shots, and so much more. Digital Single Lens Reflex (DSLR) cameras offer full control over exposure settings while also providing pre-sets and auto mode options for beginners. If you're just picking up-or considering buying-a Canon EOS 7D Mark II camera, this fun and friendly guide takes the intimidation out of making sense of the bells and whistles so you can get right down to snapping stunning photos. Covers shooting in auto mode and using live view and playback modes Explains how to dial in exposure and use lighting controls Includes easy tips for printing, posting photos online, and other ways to share images Gives you ten photo editing tricks and pro functions If you're an amateur photographer who wants better-than-entry-level gear, or a pro looking for a budget camera to add to your collection, Canon EOS 7D Mark II For Dummies has the information you need to get more bang for your buck out of this powerful camera.